A little background on how I planned and booked my trip to Cuba. I booked and planned everything on my own. I did not use an agent or travel company. I spent a few months doing the background research on what was needed for Americans to travel to the island. You can see that post in past blogs. Once I had a good understanding on the requirements, I booked my flight through Delta airlines. Pretty much all airlines fly to Cuba now. I could not book this online though. I had to actually book via phone and speak with a rep that asked me if I qualified for a general license to travel to Cuba. I stated that I did under the journalistic exception since I am a freelance blogger. I also had to eventually purchase a separate tourist travel visa which was an additional $50.00. On the day of my flight, I had to complete the paperwork for my visa as well as fill out a piece of paper to indicate which exception I was eligible to travel under. 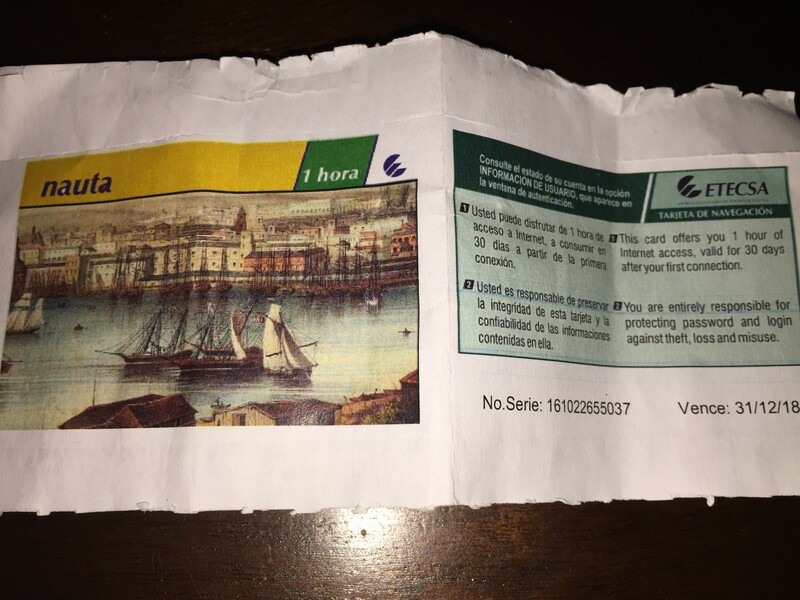 The Delta agent simply took this paper and put it in a basket with all other papers. No other questions were asked. They double checked my tourist visa and stamped my boarding pass to indicate I was okay to board and fly. The flight was very short, only two hours roughly from Atlanta. So from Charlotte, it was about 2.5-3 hours. 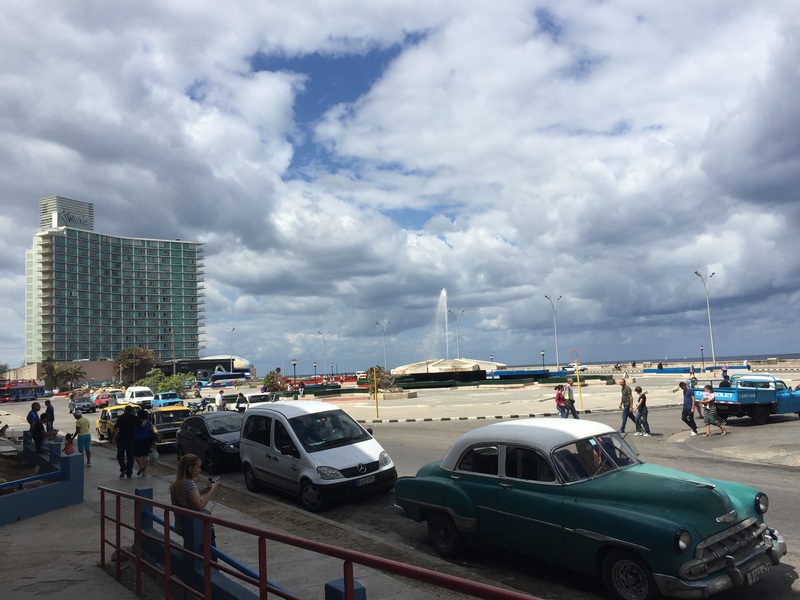 Once I arrived at the Havana airport, I went through Customs which was very fast. I showed my passport, boarding pass, and travel visa. The agent stamped my passport and my travel visa and I was on my way. With my bags in hand, I headed outside to find a currency exchange. As I mentioned in my initial Cuba post, American credit cards or debit cards are not authorized in Cuba at all. This may change in the near future. You need to have enough cash to last your entire trip. ( they will announce this a thousand times at the airport before you leave the U.S.) I planned to change small amounts at a time. However, I was met by a cab driver who agreed to take my currency as is since the currency exchange line at the airport was ridiculously long. I had brought Canadian dollars instead of U.S. dollars. I would honestly suggest Euros. Canadian dollars are less than Euros or U.S. dollars so you don’t get as much bang for you buck. There is a 10% tax on all American dollars so other currencies are easier to change and even use while in Cuba. Luckily Gloria’s son spoke English, so I was able to get directions to the closest bank and the place to purchase a WiFi card to contact my family. I put my bag down and headed out. It was a short 5 minute walk to the bank from the home. Here, I changed some of my currency to Cuban pesos. Keep in mind that Cuba is a dual currency country, meaning they use two types of money on the island. 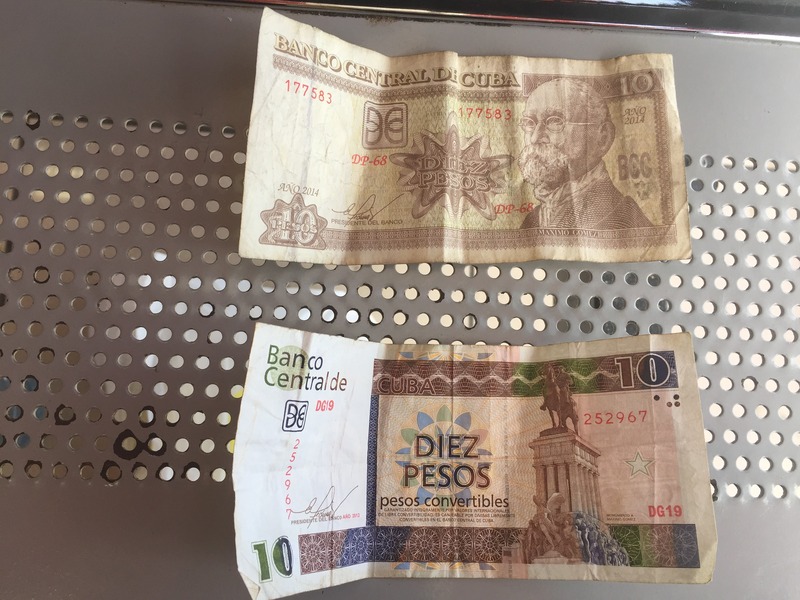 There is the Cuban national peso and the convertible peso which is used by and for tourists. Native Cubans primarily use the national peso. The convertible peso is equivalent to the USD but the national peso is not. See picture below. (National peso on top. Convertible peso on bottom) Some businesses will except either. So just be mindful of which one is listed on a menu or price list. 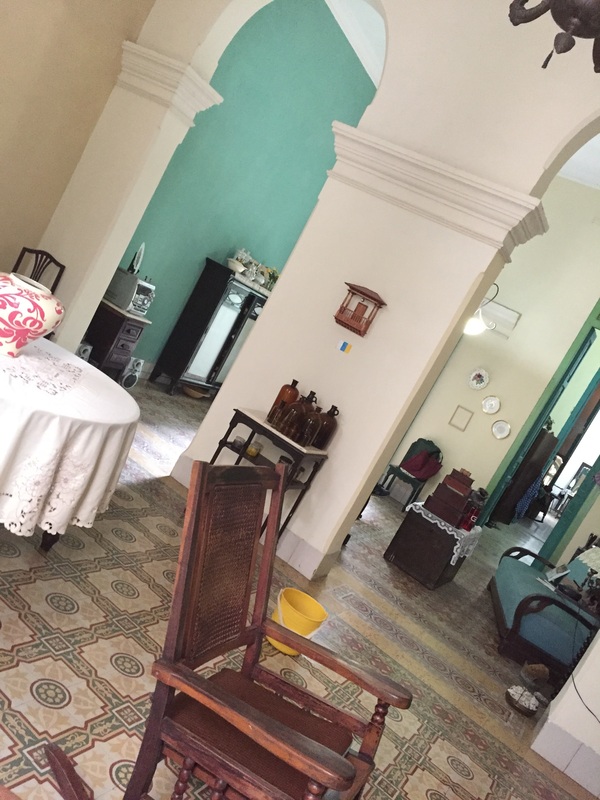 Once I checked in with my mom, I left the WiFi spot and took off to explore Old Havana. The main street in Old Havana, Calle Obispo, is where you can find most people hanging out. There are food carts, restaurants, live music, and shops all up and down the street. You can also venture into some of the other side streets too. Cuba is very safe contrary to popular belief. There weren’t many people begging on the streets but there are a lot of random dogs and cats that wonder around. However, they don’t bother you at all. It’s almost like they are human too the way the walk the streets. 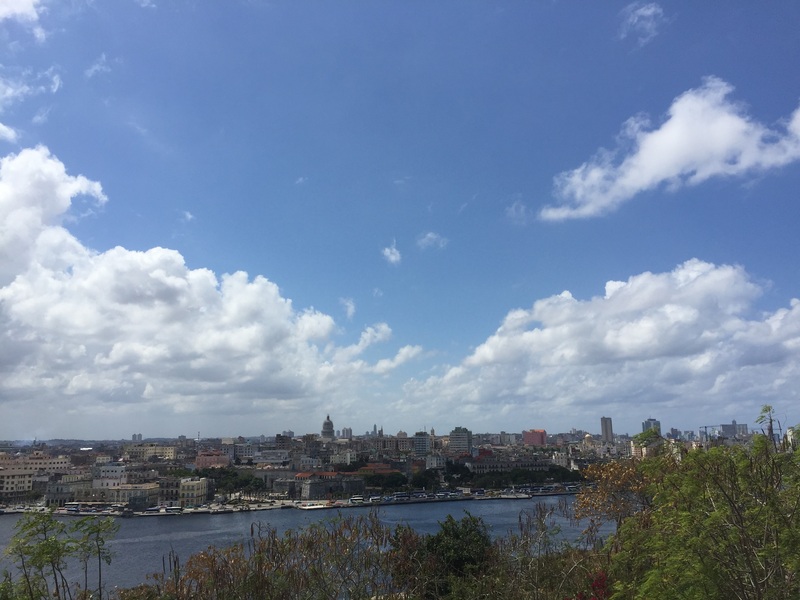 I walked around old Havana for a few hours before I headed back to the casa for a short nap. 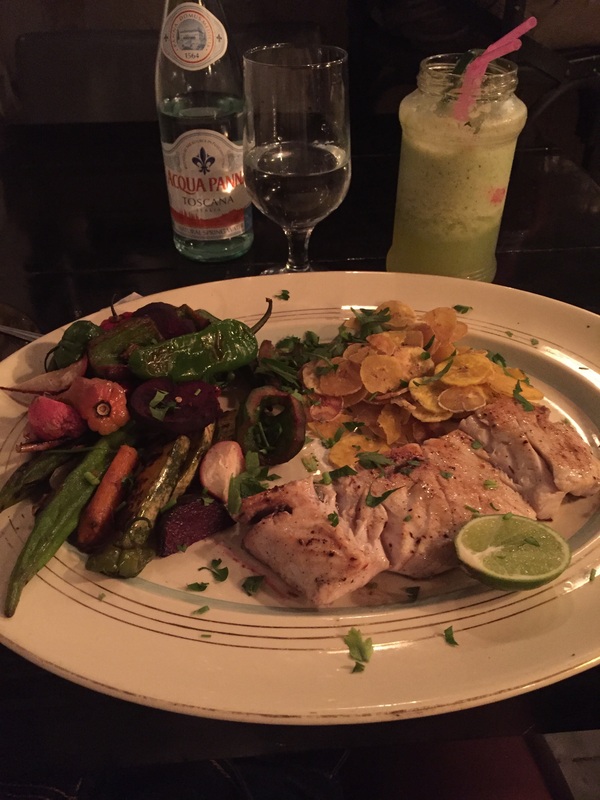 That night, I planned to eat at a popular restaurant in Old Havana on Calle O’Reilly called El Del Frente. I had made a reservation earlier in the day to ensure I had a table. It was a cute multi level restaurant with a rooftop. I ordered a cucumber lemonade and the fish of the day. Since this is a restaurant that caters to tourists, the food was a bit more pricier than other places you will find. My meal (See below) was about $15 total. 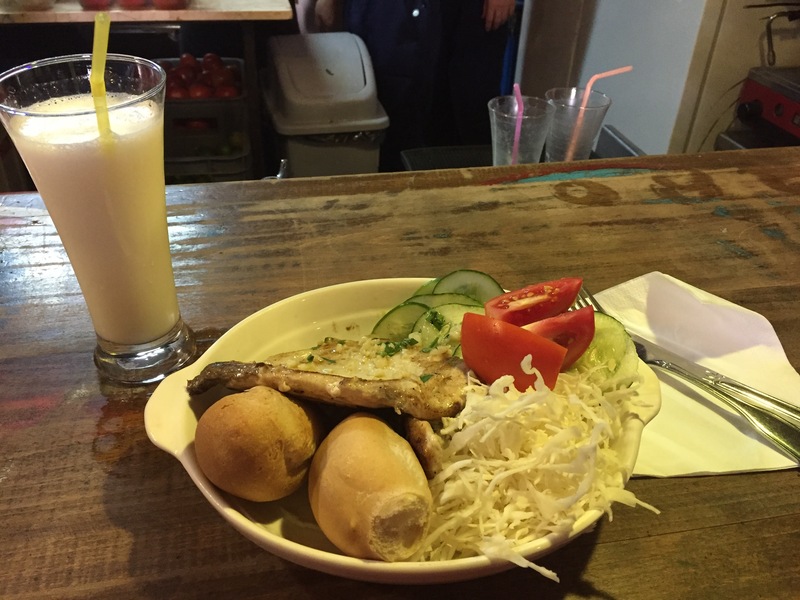 The fish was very good and so was the drink. The food could have been a bit hotter though for my taste. 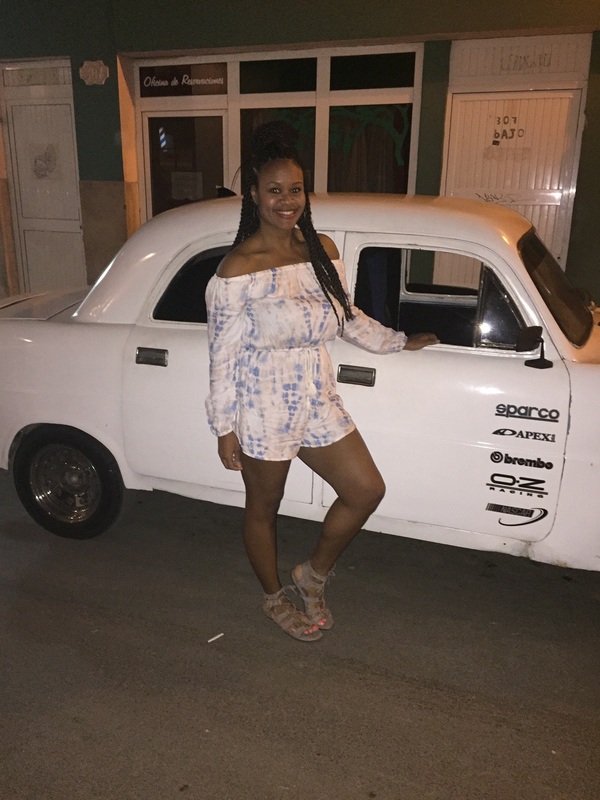 Once I finished my meal, I headed outside to find a taxi to head to the infamous Fabrica De Arte, a popular night spot in Cuba. I met Yodani who would become my personal driver for the next 24 hours or so. Like most other Cubans, Yodani had an old car but it was so dope to me. 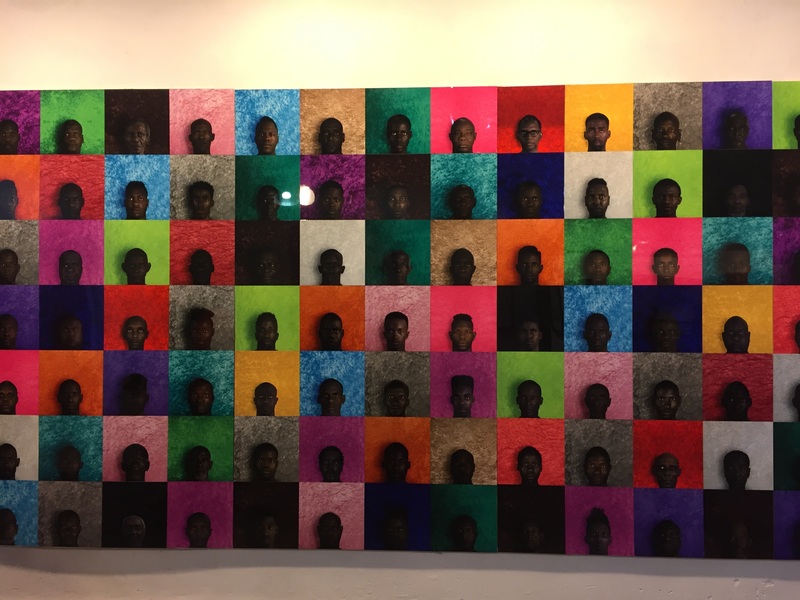 (see below) Yodani didn’t speak English, but I was able to communicate with him that I wanted to head to Fabrica de Arte (F.A.C.). He informed me that it was in Mirimar about 20 minutes from where we were and that it would be $15 roundtrip. I was fine with that. We arrived at the entrance of F.A.C. only to see that the line was crazy. It was about an hour or longer wait. I was not amused to stand in a line that long alone. Yodani asked did I want to try somewhere else, which I agreed. He then drove me about 5 minutes further to the also infamous Casa de Musica-Mirimar (this is the best one on the island. There are two in Havana) Once we arrived we were told that they would not be opening for another hour due to a private party going on. UGHHHHHH!!! I had gotten cute for nothing, or so I thought. Yodani told me he would take me back to Old Havana but he needed to pick up his boss first while we were in Mirimar. He also informed me that his boss spoke English. We went to pick up his boss and his boss told me that if I really wanted to get into F.A.C. he could get me in without waiting. YESSSSSS. We headed back to F.A.C. and as promised he walked me into the door by just saying I was a guest of his (V.I.P. baby!!!) I paid the $2 entry fee and set out to explore. Yodani agreed to pick me up at our agreed time. F.A.C. is like no other place you will visit. It’s an art gallery, movie theater, live music hall, restaurant, bar, and slight club. (there was a DJ that night but I’m not sure if they always have one. The focus is the live music) There is no WiFi in the place and they have signs to remind you of such so don’t ask. Just enjoy the moment. The art was pretty dope. They feature various artists within the building. I perused every corner of F.A.C. for about 2 hours before Yodani came to pick me up. He was there when I came out and he took me right back to my casa. He agreed to come pick me up the next day and drive me around to see the sites of Havana. The next morning I woke up to a breakfast prepared by Gloria in her home. (I told her the day before that I wanted breakfast and it was $5.) 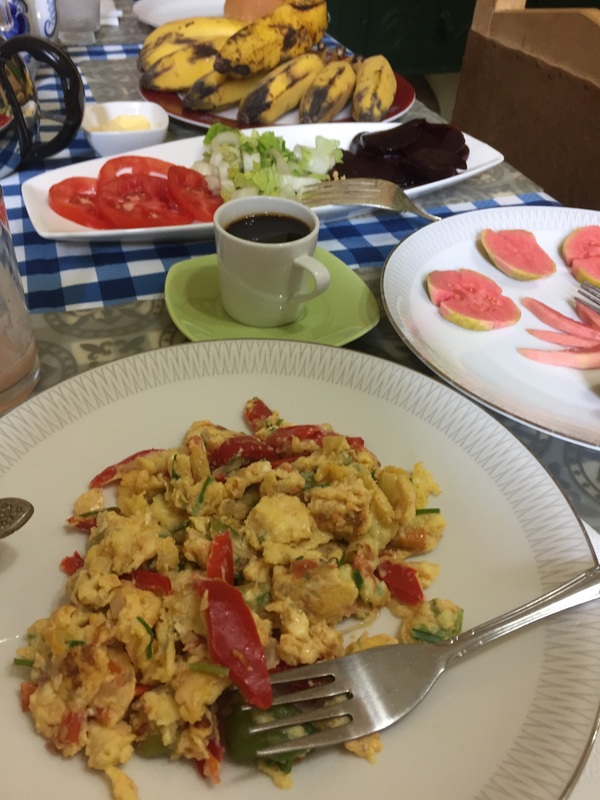 She made eggs with veggies, bread, fresh fruit, fresh fruit juice blended by her, salad, and the best Cuban coffee. 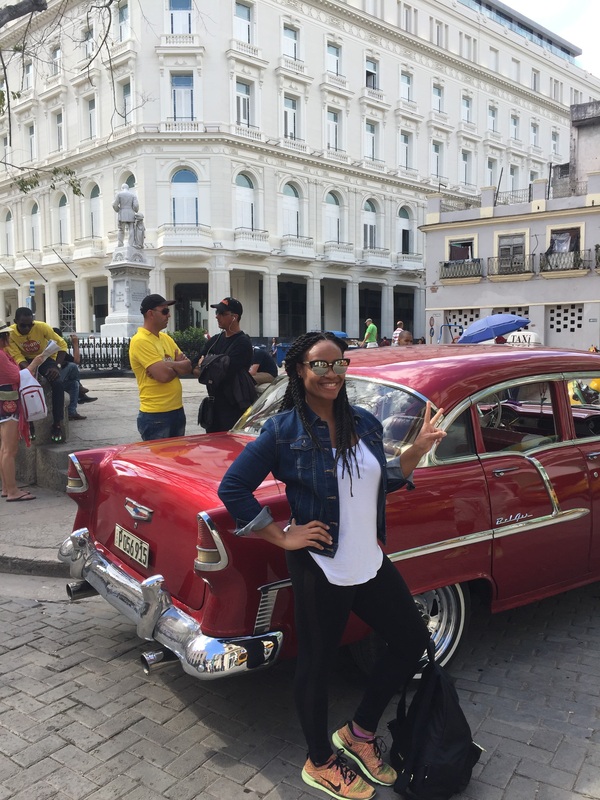 I got dressed and as soon as I stepped out the door, Yodani was pulling up to take me on my day of exploring Havana. Yodani literally took me all over Havana. 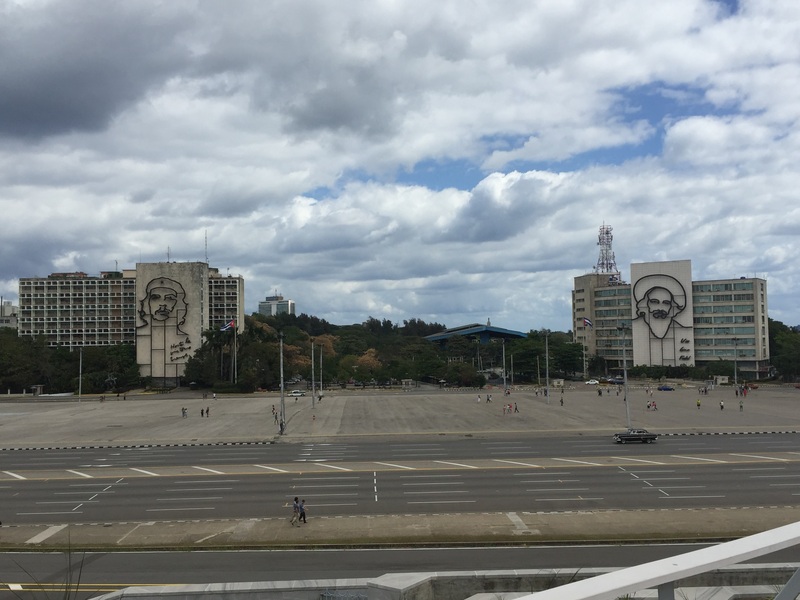 We saw everything from the Plaza de Revolucion, the Cristo statue, the more modern area Vedado, and ended with lunch at El Chanchullero ( a popular but economical restaurant in Havana. We waited about 30-40 minutes. My meal with a Pina Colada was only $7 total). 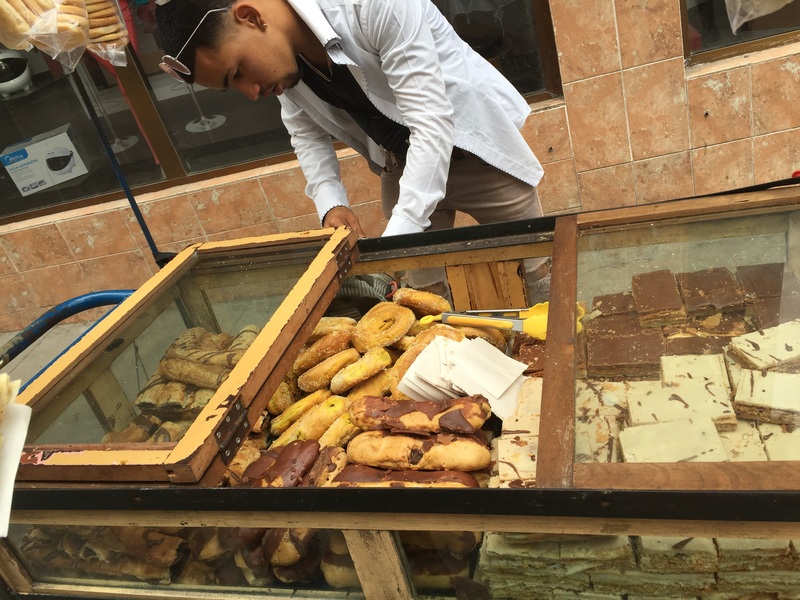 We even ate dulces from a dulce street cart for about .50. If you have the chance, try something off of a Dulce cart. They are really good. After about 5 hours of exploring, Yodani took me back to my casa. He only asked for $30 for the whole day of driving. If you rent one of the cute classic cars you will pay about $20 per hour. So do the math on that and plan accordingly. Once I was back in my casa it rained for about two hours. I took a nap and did some reading in that time since I didn’t have wifi. It was actually very relaxing. Once the rain stopped for good, I set back out on foot to walk the main streets of Old Havana. There were lots of people out, locals and tourists alike. I would eventually meet Cuban bae (See previous post) during this walk as well. 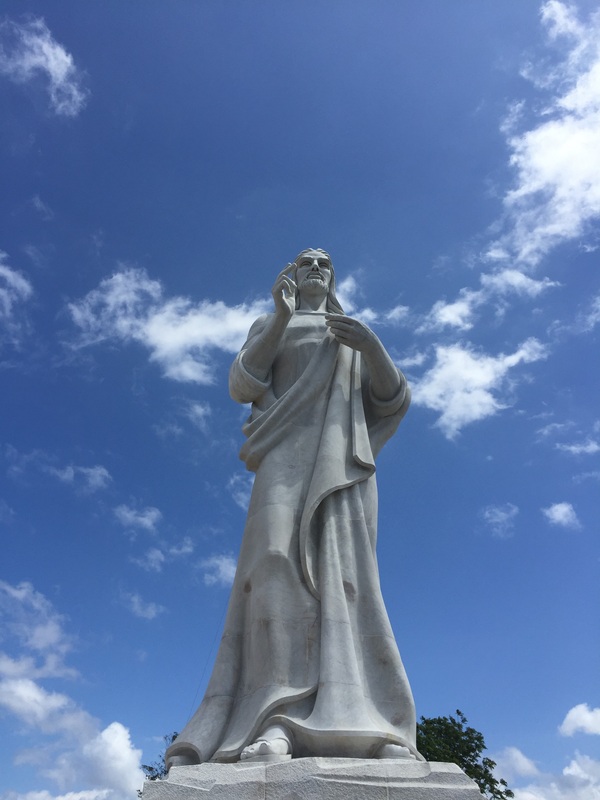 He along with his friend showed me some other Cuban sites that I would have missed otherwise. I was very appreciative of them being my personal tour guides. We ended up at the Hotel Inglettera which had a live band playing on the rooftop terrace. Cuban bae attempted to teach me to salsa but ummmm I had two left feet. (Don’t judge me) He then walked me back to my casa where we set out on the stoop and talked for about 2 more hours. He taught me about life as a Cuban and the hardships they still face. It was a very eye opening convo, all in Spanish too! Once I got tired we parted ways and I headed to bed to prepare for an early morning of traveling to Varadero, Cuba. My taxi collectivo would be at the casa at 8:30 to take me to the next city. 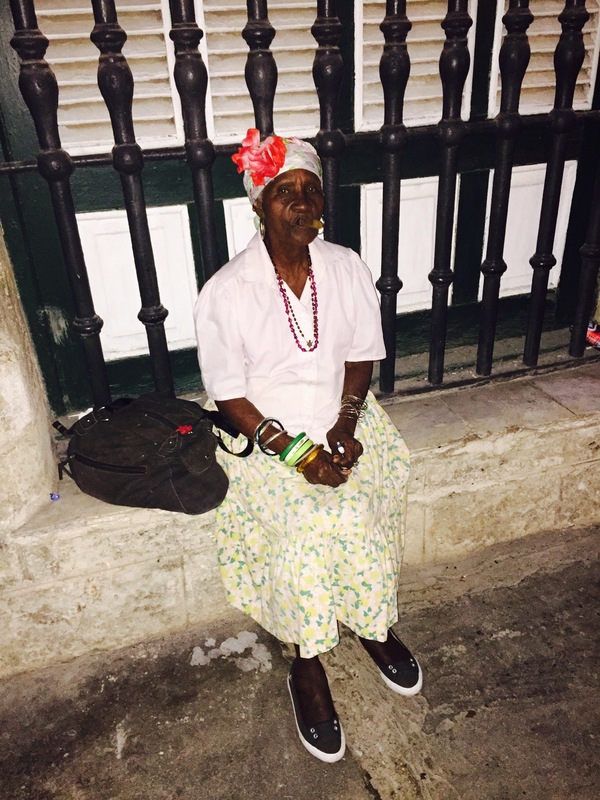 My time in Old Havana was one that I will never forget. The lively people and music playing everywhere really makes this place come alive. Not once did I feel unsafe or in danger while walking at night. Again, a lot of this was due to being fully aware of my surroundings since I was not all in my phone 24/7 like I would be on any other trip. Just appreciate the time of being disconnected and enjoy all that Cuba and Old Havana have to offer.